Our wiring course will help you understand the problems of wiring boilers and zone valves. Danfoss & Honeywell have given us special permission to provide you with technical support not normally available. We have spent over two years with both companies’ amazing support to find a way to bring you two courses on one day. We’ve also employed a graphic designer to help us to change the standard black and white schematic drawings into beautiful colour, this makes them so easy to follow just like the London underground map. 3 Port 2 Port rigs from both firms so you can practice, practice, practice until perfect. Frost Protection: Often missing on installations, understand their importance. S.I. Programmers: Learn when, why and how to use them (they make money). Zone Valves can have a orange, white, brown and grey wires, confused? You will understand and learn which wire goes where and why. Sequence of Wiring: Most installers and electricians don’t know there is one, perhaps that’s why so many mistakes are made. Fault Finding: Flow charts for all possible faults, testing room/cylinder stats with and without voltage using your multimeter, our easy to follow diagrams will show what’s wrong. As always, the course is fully supported by our excellent course notes for you to take with you. You’ll also get a free copy of our fantastic Central Heating Wiring & Controls book which you’ll use on the day when you’re wiring up our training rigs. When you leave us after a busy day you’ll be armed with the knowledge and confidence to tackle more complex jobs. If you’d like to book a place on the course, please fill out an application form today! Want to attend a course? Please complete an application form and then pay in the shop. Courses costs £160.00 per person each (no VAT) or save £50 by booking both courses for £270.00 per person (no VAT). 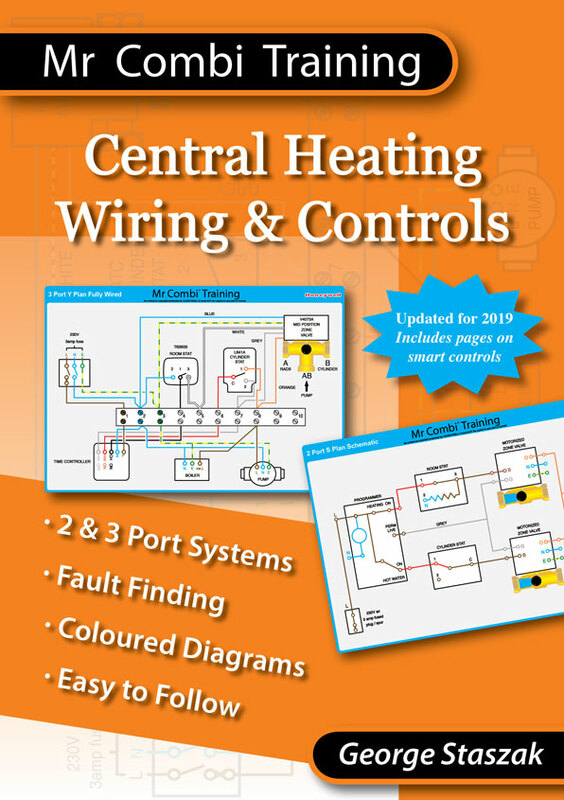 Take a look at our Central Heating Wiring & Controls book! You'll get a free copy of our book when you attend our Wiring & Controls course. Find out more on the Central Heating Wiring & Controls page. Copyright © 2012-2019 Mr Combi Ltd. | Mr Combi is a registered trade mark of Mr Combi Ltd.